We have carved a niche amongst the most trusted name in this domain involved in offering a wide range of Brinjal Seed to our clients. 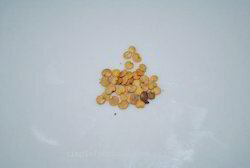 This Brinjal Seed is extensively used at different place for producing brinjal. Our product range is extremely pure and available in various packing. We are a renowned name that is actively committed towards offering qualitative Brinjal CHU-CHU Black Nagina Seeds. Our provided Brinjal CHU-CHU Black Nagina Seed is available in various packaging options for our clients. : Dark black and shinning, calyx green, highly acceptable. Buy Kashmiri Brinjal Purple Seeds online now. - Harvest 50-55 days after transplanting. We offer the best quality fresh brinjal which is procured by our quality experts from the best farms. Our organic green brinjal is pesticide free and is of 100% pure quality. The brinjal vegetables we offer are highly demanded and can be availed at competitive prices from us. We have a made a position for ourselves as one of the well known natural organic brinjal exporters. Specification: Very vigorous bush type plants, having excellent branching and fruiting habit. Fruits are round shaped attractive shining, big sized, solitary, deep purple color 200-250 gm in weight. Variety shows wide adaptability and very good self life.